In Moneyball, Brad Pitt, left, plays Oakland A's general manager Billy Beane. Jonah Hill plays Peter Brand, the numbers geek Beane hires to help rebuild the team. The Oakland Athletics rocked the world of baseball in 2002 by using statistical analysis to build a winning team. Now Moneyball, the film based on that breakout year, is shaking up the sports-movie genre by making stats geeks the MVPs. 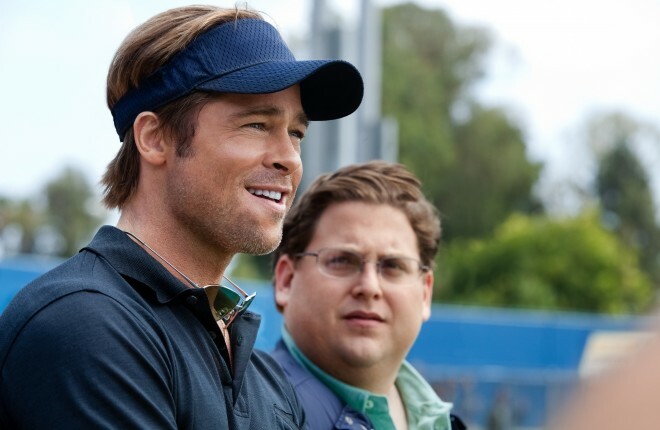 In the film, A’s general manager Billy Beane (played by Brad Pitt) shakes up his ball club’s scouting operation by bringing in a number-cruncher named Peter Brand (Jonah Hill). Brand has a plan to mathematically analyze players in ways traditional scouts never had. By all outward appearances, Academy Award-nominated director Bennett Miller’s adaptation of Michael Lewis’ best-selling book, Moneyball: The Art of Winning an Unfair Game, follows a pretty rote sports-film path: Rag-tag ballplayers form a powerhouse team that succeeds against all odds. It’s been done up and down, from The Bad News Bears to Major League to Angels in the Outfield. What sets Moneyball apart is the statistical analysis that brought the players together for their banner season. The method, dubbed “sabermetrics” by baseball historian Bill James, comes to the Oakland front office after Beane snatches up a Yale-educated whiz kid from the Cleveland Indians and brings him West. Hill’s character is actually an amalgamation of people who worked for Beane during the A’s breakout season — including the manager’s right-hand man, Paul DePodesta — but the outcome is largely the same as the real story. Beane knows he can’t win with a payroll that’s a fraction marquee teams’ budget, so Brand teaches him (and his scouts) how to use their money to buy hits and runs, as opposed to baseball stars. In the real world, Beane’s revolutionary move altered the way people thought about baseball. In the film, as in real life, the math paid off, amazing baseball fans in the process. By focusing on players’ on-base percentages instead of home-run records, the A’s went on an unprecedented 20-game winning streak in 2002, topped off by a game-saving, bottom-of-the-9th homer by Scott Hatteberg (played by Parks and Recreation’s Chris Pratt). It’s not until that moment, in the third act, that the thrill of watching a great sports film comes back into sharp focus. Until that point, the story has zeroed-in on the sabermetrics system and all the ways it could fail. We learn why Beane, a would-be baseball star who never made it, wanted to change scouting methods. A few humorous takes show Brand, more used to seeing players as numbers than people, trying to communicate with brusque jocks. But when Hatteberg hits his homer, it’s as good as any moment in Field of Dreams. Moneyball is the most cerebral sports drama since Any Given Sunday. That’s the magic of Moneyball — it’s a PG-13 sports movie for wonks who thought card-counting was the most interesting part of Rain Man. It’s also a math movie for sports fans who want to see a group of underdogs do well. Add in all the complex, front-office fuss, and Moneyball becomes the most cerebral sports drama since Oliver Stone’s Any Given Sunday. Thanks to smart performances by both Pitt and Hill, the film doesn’t boil down to a nerds-versus-jocks film — by the end, the two are on the same team. The moral of the film is fairly simple: Everyone’s value is subjective. Players not highly regarded by one team could become incredible assets to another. Numbers geeks not appreciated by baseball in general could prove invaluable to managers looking to game the system. It’s not the kind of movie everyone will find priceless, but for moviegoers who like brains and balls, Moneyball knocks it out of the park. WIRED Excellent performances by Brad Pitt and the typically comedic Jonah Hill. Makes statistical analysis as fascinating as a pennant race. Inspiration for underappreciated folks everywhere. TIRED Despite the data-crunching, it’s still a fairly common sports-movie story arc. Narrative suffers a few too many lulls.